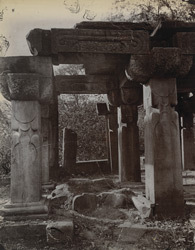 This photograph is from the Archaeological Survey of India Collections and it was taken by Joseph David Beglar in 1883-84. It shows a view of the Bhim-ka-Chauri temple at Mokundara. The temple is described by H.B.W.Garrick in his 'Report of a tour in the Panjab and Rajputana in 1883-84' as follows, "Of the two early temples at Mokand-dwara, one is called Bhim-ke-chauri, or 'Bhim's Nuptial Hall'. This temple is remarkable chiefly on account of its lintels and consoles, being elaborately carved all over with strange animal forms and floral scrolls..." The temple is badly ruined, twenty two feet wide and bears a short inscription on one of its pillars. The pillars are six and a half feet tall whilst the capitals are one and a half feet in height.